Quite out of character, today's book review is about a novel by Chilean author Isabel Allende (among numerous other books, she also wrote The House of the Spirits that was eventually made into a movie starring Merryl Streep, Jeremy Irons, Glenn Close, Winona Ryder and Antonio Banderas), in fact it is a biographical novel: Inés of My Soul. As I read Spanish fluently, I did not read it in English, but of course the content is the same. It is such a pleasure to read books by this author. In this case she has outdone herself, writing about Inés de Suarez (1507 - 1580), born in Plasencia in Spain, who eventually emigrated (unheard of in those years to do so as a woman on her own) to The New World in search of her husband who was already there, ostensibly fighting on the side of Pizarro, conqueror of Peru. In her search of him, she passes through Panama and Peru where she discovers he has died, and finally winds up in Chile. 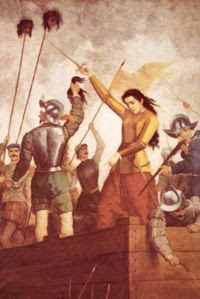 Along with Pedro de Valdivia, with whom she maintained a long and close relationship, she helped to conquer Chile and was hugely instrumental in many ways during that process. The reason this novelized version - written in the first person - of her life is so interesting and compelling, is because of the immediacy with which Allende describes life in that century, both in Spain and in the New World, for a woman, for a soldier, and for the Indians who were being conquered and deprived of their lands and culture. The fact that this real life woman - Inés de Suarez - was able to overcome the hindrances and prejudices and social and religious obstacles a woman normally was obliged to tolerate over the course of a lifetime, makes the book even more fascinating. This woman was brave, pro-active, intelligent, tender, loving, strong, creative, self disciplined, resilient, strove to live a life with meaning, as well as an authentic life, and is well worth consideration. What a role model to spring out of the 16th Century! I highly recommend this book.